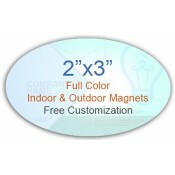 Custom oval magnets are perfect, if you wish to break away from monotony of rectangular and square advertising magnets. These promotional oval magnets are ideal for any kind of social, business and individual awareness building because people adore oval shapes. You can easily stand out with these typical magnets. 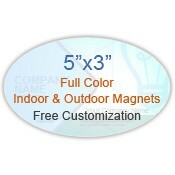 Available from 3”x2” to larger sizes, you can choose from oval magnets for cars and refrigerators. Free digital full color printing is offered to all oval shaped magnets. Have you ever thought why some campaigns are instantly noticed and why others fail? The only difference lies in the approach. The ones who fail are those who are stuck to the monotony of “do’s” and “dont’s”. They are also not ready to think out of the box. However, the successful ones believe in smart advertising. If you believe in smart marketing, custom oval magnets are going to be the right choice. 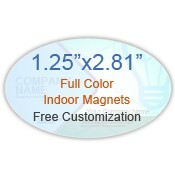 You can stay assured that your business or your individual goodwill is going to receive a boost after giving this oval shaped magnet as a gift! You can employ logo imprinted oval custom magnets as business cards, flyers or value coupons, calendars, discount cards, etc. Over the years, many individuals have sought these oval magnets for imprinting save the dates, invitations, anniversary or holiday greetings, etc. Most of the oval magnets offered here can be availed in three stock sizes 20 MIL, 25 MIL and 30 MIL. 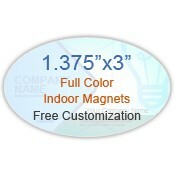 Promotional oval magnets with stock thickness 20 MIL & 25 MIL are sought for indoor advertising. These are made of high quality material and can be conveniently placed over refrigerator doors or filing cabinets. Proudly display your business messages during regular drives by using these custom oval car magnets. 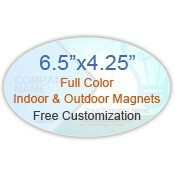 Outdoor magnets are durable, 30 MIL thick and laminated with UV resistant coating. 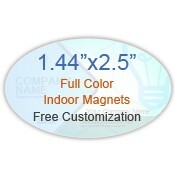 When positioned, these wear and tear resistant oval magnets for cars will easily make your brand information or awareness information to stand out against the car door or bumper. 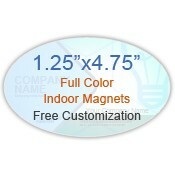 To make it more appealing, you can choose to imprint your brand information in bold colors. Order your custom oval shape magnets today and receive free shipping, free online design proof, free digital artwork and free design assistance. You can avail 110% price match guarantee on these styles. 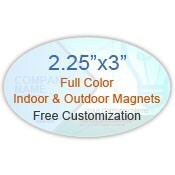 Shop for wholesale promotional oval shaped magnets and have large savings. Do you have any worries or skepticism regarding the success of these custom oval shaped magnets, feel free to contact us at 855-762-4638 or mail us at info@Cmagnets.com.